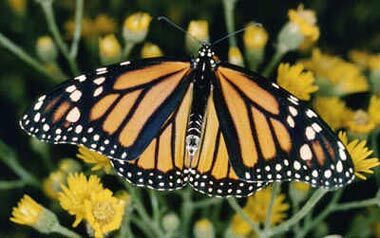 The migratory monarch is a native butterfly well-known to Alabama. 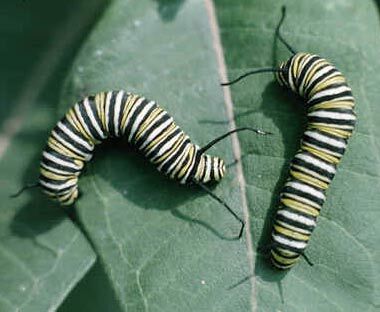 Both caterpillar and adult butterfly are brilliant in color as a warning (the Monarch butterfly ingests toxins from the milkweed plant which are poisonous to predators). Monarch butterfly caterpillars photo © Dr. Peter Bryant: Monarch Butterfly (all rights reserved; used by permission). 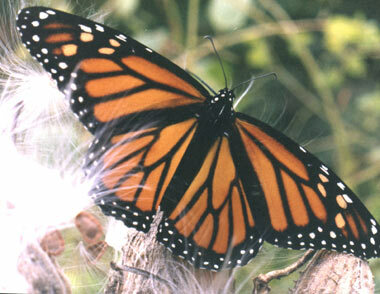 Photo of adult monarch © Dr. Peter Bryant: Monarch Butterfly (all rights reserved; used by permission).